The Coney Island Polar Bear Club is going for their first swim of the season on Sunday, December 2nd, a month later than usual due to Hurricane Sandy and its aftermath. “We extend our condolences to everyone who was affected by the hurricane,” Dennis Thomas, president of the winter swimming club told ATZ. “We are happy to help out the Parks Department and the Aquarium with cleanup and look forward to a shortened but a good strong season.” Last year’s first swim, shown in the above vid by a club member, was on November 6th and the water temp was 51F. The Bears swim at 1pm every Sunday from November through April. There are currently 150 full-time members of the club with about 100 coming out for weekly swims, says Thomas. Membership is closed for the 2012-2013 season, but you can join them for a guest swim. Just show up at the Bears “Clubhouse” at the Aquarium’s Education Hall on the Boardwalk at West 8th Street by 12:30 pm with your bathing suit, a towel, surf boots or an extra pair of sneakers, and some warm clothing. Just 31 days away, the Coney Island Polar Bear Club’s annual January 1st Swim is one of the more unusual ways to welcome the New Year. It’s become increasingly popular and a winter counterpart to the Mermaid Parade. 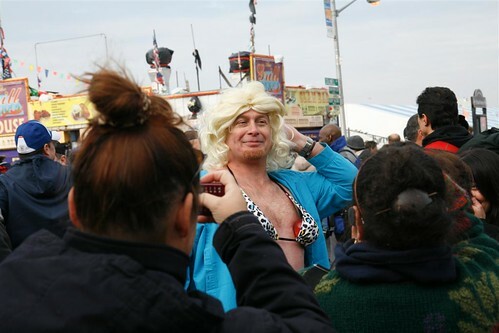 On New Year’s Day 2012 in Coney Island, a record 3,000 “Did “It” at the Polar Bear Plunge, nearly three times as many as the previous year, Thomas told ATZ. The event is free and open to the public, but Freezin’ for a Reason is also a major fundraiser for Camp Sunshine, a retreat for children with life threatening illnesses and their families. On New Year’s Day 2012 in Coney Island, a record number of people, nearly three times as many as last year, did the Polar Bear Plunge. Dennis Thomas, president of the Coney Island Polar Bear Club told ATZ that the number of “I Did It” certificates given out to registered swimmers soared. 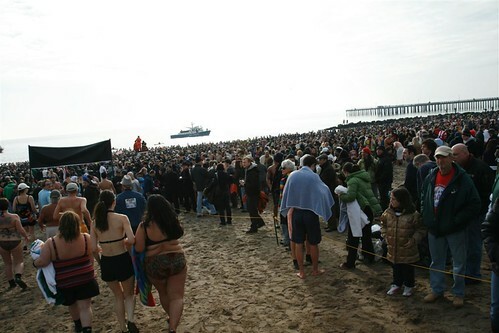 “We went through almost 3,000,” said Thomas, who noted that the unofficial number of plungers is always higher because “some register, others don’t.” On New Year’s Day 2011, the official tally of registered swimmers was about 1,200 and the Bears gave out 1,000 certificates before they ran out. “We had a DJ on Stillwell to provide entertainment and there were hundreds of people dancing,” Thomas said. Some of the costumed plungers were familiar from previous years’ swims or reminiscent of the Mermaid Parade. There was the Metrocard Man, Big Babies in Diapers, a group of jailbirds, a pirate couple in their pirate ship, and a gaggle of superheroes, as well as penguins, ducks, and of course polar bears! 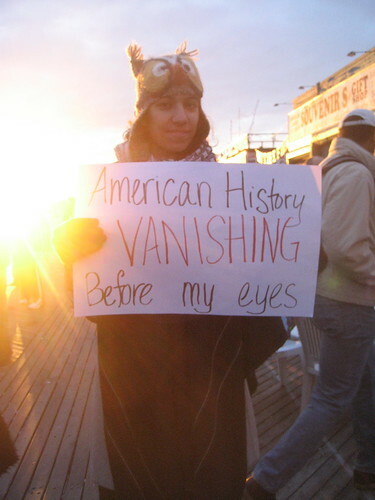 Some carried hand-made signs that read Occupy Peace, Occupy the Ocean, Free Polar Hugs and Polar Bears from Bronx. Part of it is just word of mouth. People went last year, told their friends who said, yeah I want to do that next year. Part of it is that Coney Island has been in the press so much lately that it is going through its own revival regardless of the development plans. Crowds out there are getting bigger for all events the past 2 years. Part of it is our club seems to have a larger media presence than in the past and things like our website make us much easier to find than say, 10 years ago. And somehow we are less portrayed as those idiots on the beach that cause network newscasters to chuckle and shake their heads after a 10 second clip before the weather report. The New Year’s Swim is basically free and open to the public, that might be a draw in the current economy as well. I think it’s all these things that explains the larger crowds. After this year’s record attendance, Thomas says “It’s getting so big, we’re pushed to the limits.” He and his team begin working on the event in November, when their winter swimming season starts. “We really need to enlist more help. The logistics are getting to be enormous and it imposes a lot more costs on us.” In past years, sponsorships from Planet Green and Vaseline Skin Care helped out. The Coney Island Polar Bear Club’s New Year’s Day Swim is wacky fun, but they’re Freezin’ for a Reason. Support a Bear and make a pledge now. According to the Bears’ website, “There is no fee for swimmers or observers but we encourage all participants to make a voluntary donation to our partner Camp Sunshine.” The Coney Island Plunge has already raised more than $20,000! 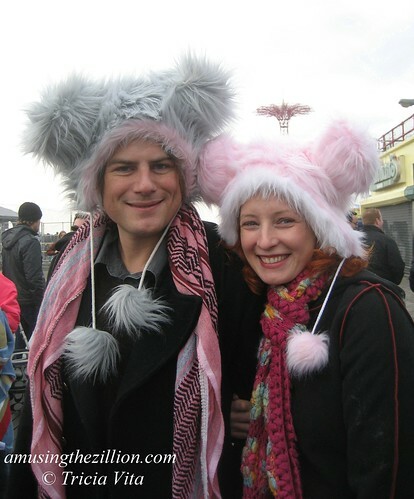 On January 1, 2010, more than one thousand people took the plunge, including about 140 members of the Polar Bear Club (ATZ, “By the Numbers: Coney Island New Year’s Day Polar Bear Swim 2010,” January 8, 2010). Tomorrow’s dip in the ocean is at 1 pm sharp, but get there early for festivities on the Boardwalk. You can register, pledge and buy Polar Bear Tee’s on the Boardwalk from 11 am. 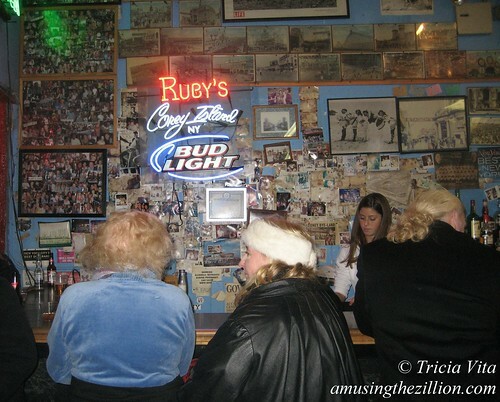 On New Year’s Day Ruby’s Bar & Grill will be the place to raise a toast to the New Year and to the real Coney Island. If you missed the last of the “Last Call” party/protests at Ruby’s in November, tomorrow may be your final last chance to have a drink at Ruby’s. Of course, we hope not. 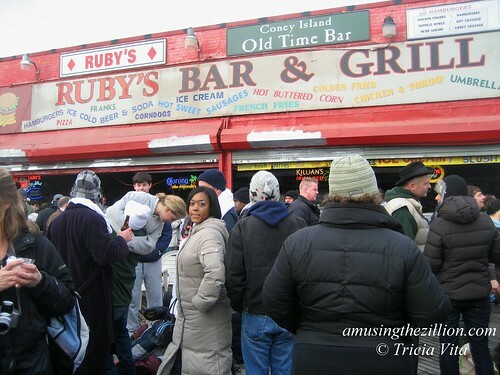 Ruby’s & the other evicted Boardwalk businesses made Curbed’s 2010 List of Threatened Neighborhood Places that are not dead yet. What to do? Take a cue from the folks who showed up at November 6th’s Rally, Party and Last Call and bring along a hand-made sign. Ruby’s will open at 10:30 am. Live music from 12:30 till around 4 pm. 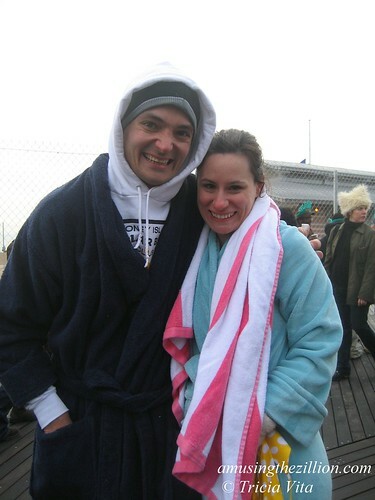 Are you ready for the Coney Island Polar Bear Club’s New Year’s Day plunge? Whether you plan to swim or spectate, this high-spirited vid of today’s snowy Sunday swim should put you in the mood. “Water temp 40 outside is 24. Coney expecting 13″ of snow – the bears go for a dip at the start of the snowstorm,” says Rubyshost, who is a Polar Bear and shot the video both in and out of the water. The Coney Island Polar Bears swim at 1 pm every Sunday from November through April. The club has 140 regular members, but the New Year’s Day event attracts hundreds of first timers. Last year about 1,000 swimmers participated, said Polar Bear president Dennis Thomas. The world-famous event is a fundraiser to benefit Camp Sunshine. Participants are requested to raise a minimum of $100 in pledges. The 2010 swim raised over $23,000 for the retreat for children with life-threatening illnesses. To register for the 2011 New Year’s Day Plunge or sponsor a swimmer, visit www.freezinforareason.com. Thomas: I believe there were over 1000 swimmers this New Year’s. I don’t have any numbers for last year, but it was brutally cold last year and the crowd felt noticeably larger than last year. We have about 140 full-time members in the club. At our weekly swims we have been averaging 80-90 swimmers. I think we had more than 100 there on New Year’s. ATZ: what are the reasons for the event growing every year? Was this year’s larger crowd due to the 41 degree air temp? Thomas: I’m not sure why the event is growing. Part of it is just word of mouth. People went last year, told their friends who said, yeah I want to do that next year. Part of it is that Coney Island has been in the press so much lately that it is going through its own revival regardless of the development plans. Crowds out there are getting bigger for all events the past 2 years. ATZ: How many spectators were there? And how many people involved with staffing the event including crowd control and safety? We noticed Chuck Reichenthal (District Manager of CB 13) in some pix. Thomas: Again, it’s hard to estimate the size of the crowds on the beach. I believe someone told me the Fire Dept. estimated 10,000 people. I can’t verify that, but I also don’t doubt it. The entire bay was filled with people. I’m not sure on the numbers of the safety teams but there were 2 police boats, 3 Fire Dept boats, numerous Fire Dept EMT teams, ambulance crews, water safety teams through CERT, 3 kayakers, and at least 5 lifeguards and countless volunteers from the Polar Bear Club. ATZ: What are latest stats on how much money was raised for Camp Sunshine? People can still mail in checks, right? Thomas: I don’t have final figures, but we raised somewhere around $28,000 this year, up from last year which in this economy is pretty decent. And yes, people can still make contributions. ATZ: Looking at the flickr pix by various photographers it seemed like more people were wearing costumes than in previous years. Maybe that’s just the sort of thing photographers tend to take more photos of? Or maybe there were just more people, more costumes? Do you have any comments or insight about that? Thomas: The costume thing. Maybe it’s part of the Mermaid Parade spirit and the fact that it is after all Coney Island. 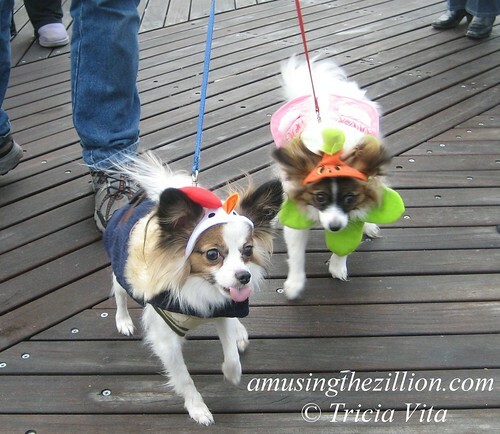 We neither encourage nor discourage costumes. People just do that on their own. And it is a holiday, and a bit of an absurd activity. That must play a role in it. The Coney Island Polar Bear Club swims at 1 pm every Sunday from November through April. To join them as a guest, show up at the New York Aquarium Education Hall, on the Boardwalk at West 8th Street by 12:30 pm. The memorial began the day after Christmas with our handmade collage, a friend’s bouquet of flowers and a banner of a tightrope dancer. Two days later, we learned the collage had been stolen, its plastic fasteners cut. When the black ink on the banner bled in the rain, photographer Bruce Handy said the ballerina was weeping. But the shrine grew to include photos, banner painter Marie Roberts’ paintbrush (symbolizing a fresh start), beads, a paper mache mask, and a cane. 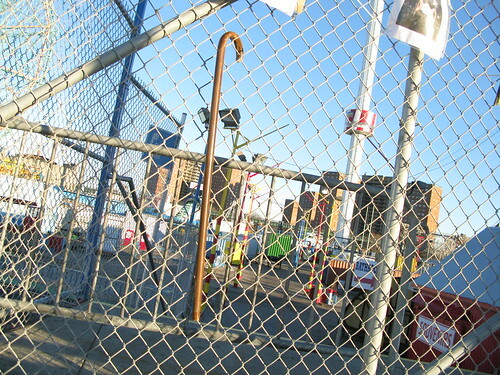 The flowers remained in place through opening day of Coney Island’s 2009 season. 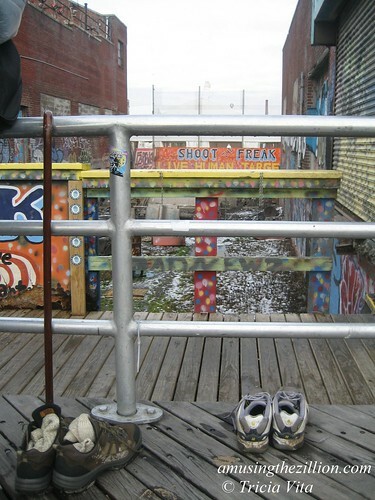 On January 1, 2010, we’ll be in Coney Island as usual to celebrate the New Year with the multitude of friends and strangers who come for the Polar Bear Club Swim. No, we’re not swimming, but we’re sponsoring a Bear who is Freezin’ for a Reason and you can, too. It’s for a good cause–they’re raising funds for Camp Sunshine. We’d like to decorate the gate with a few photos, too. In addition to memorializing the good times at Astroland, we want to let visitors know that Coney Island is not closed! 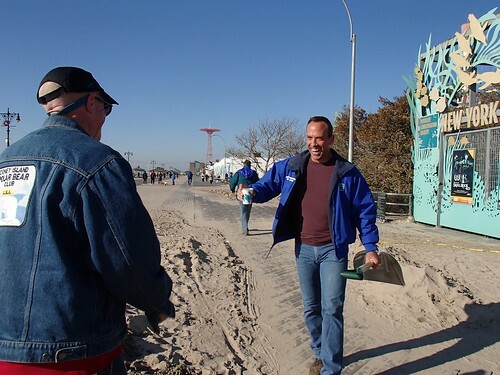 On Palm Sunday (March 28, 2010), the Cyclone Roller Coaster, Deno’s Wonder Wheel Park, McCullough’s Kiddie Park, Eldorado Bumper Cars, Coney Island Sideshow and other Coney Island businesses open for the season. By Memorial Day Weekend, the former Astroland site will be home to a yet-to-be-designated amusement operator‘s rides and attractions. We anticipate nothing less than a spectacular summer season. Happy New Year Everyone! 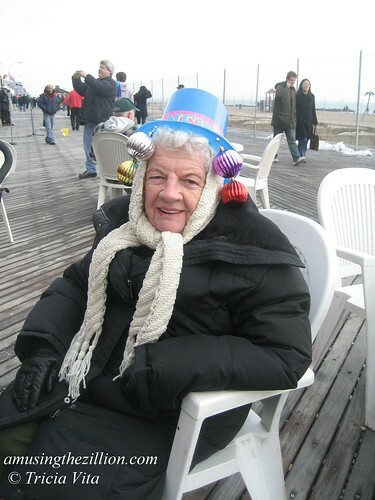 Happy New Year to Coney Island!